Porcelain is one of the most commonly used stone products. It is strong, shiny, resistant to wear and tear, and rather easy to manufacture. Porcelain tiles are available in a variety of styles, colors, and sizes. These tiles are often used to cover an interior floor, decorate a bathroom wall, or place down as swimming pool copings. When ordered in bulk, porcelain is quite affordable. Manufacturers of natural stone products often maintain a specialized fabrication division that produces collections of decorative porcelain. This is usually a different process than that performed by a company making porcelain fixtures. A wholesale importer and distributor such as Stonexchange has direct ties to manufacturers of fine-quality porcelain tile. Retailers, home improvement centers, and independent installers will save money by purchasing porcelain tile collections in full crate loads. Porcelain tiles are somewhat different in their composition from the standard ceramic tiles seen in most retail flooring supply stores. Ceramic tiles are made from white or red clay and fired in a kiln. After they are fired, the tiles are glazed with a finishing product that results in the actual color and texture of the material. Porcelain is made from very fine dust. The dust is a mixture of clay and other stone material. It is pressed into very dense tiles that are somewhat heavier and stronger than ceramic products. Unlike ceramic, the color of full-body porcelain tiles is uniform, with the shade penetrating the entire thickness of the material. Porcelain has a very low water absorption rate because of its density. However, the actual grade of the material depends on the clay used, the density to which it is compressed, and the type of glaze covering the tile. Porcelain is virtually frost-proof, making it an exceptionally suitable product for outdoor use. Porcelain tiles are graded according to their ability to stand up to scuffing, wear and tear, and resistance to impacts. The Porcelain Enamel Institute grades tiles on a scale that reflects the recommended use of the material. In other words, the PEI rating does not measure actual quality of the tiles but rather indicates the proper use. Class 0 tiles are intended for use in areas where there will be no foot traffic. At the opposite end of the scale is Class 5. 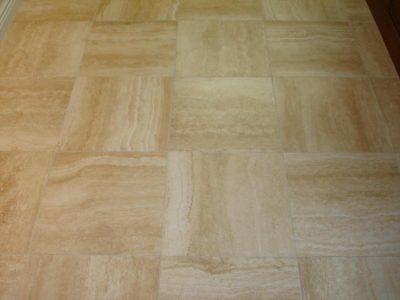 These tiles are suitable for use in commercial or residential properties where foot traffic is heavy and constant. Glazed porcelain tiles are coated with liquid glass, which is then baked into the surface of the clay. Full-body porcelain tiles are even in color because the shade extends through the entire thickness of the tile. Both of these porcelain products are available in a wide variety of color shades. Manufacturers used specialized cutting equipment to shape the edges of the tiles. After the tiles are fired and cooled, the edges are often rounded or beveled. The special collections often seen in retail flooring supply outlets usually carry a catalog designation that pertains to the actual design, surface texture, and color. Ordering porcelain tiles as a replacement for broken or chipped material can be problematic for some. It is often difficult to find an exact color match because tiles of a certain color shade and texture are often discontinued by the manufacturer. This is why contractors that set tiles made from porcelain often supply themselves with replacement tiles before starting the installation project. Leftover tiles are sold to the developer and made available to business property owners should damage to the original tiles occur. Special orders for replacement tiles may also be an option. Merchant retailers buying directly from a manufacturing operation or its import partner are much more likely to find replacement tiles that match the originals. Manufacturers usually announce new color patterns to their distribution partners. Samples are often given to these importers, and commercial clients can show these sample tiles to their potential customers. Porcelain tiles are denser and less susceptible to breakage than ceramic clay products, but shipping these tiles overseas still means taking precautionary measures. At Stonexchange, we distribute large quantities of porcelain tiles to commercial customers located all across the nation. We only purchase tiles in bulk, saving a considerable amount of money on freight charges. We offer our customers the finest quality tiles at a fraction of retail cost because we partner directly with the manufacturers. Our clients include flooring product retailers, independent tile setting contractors, and home improvement centers. Because we maintain a large inventory of the latest style collections, we can offer our customers rapid service on delivery of tiles. Many of our clients are repeat customers, usually retailers that sell direct to installers. Our tiles are available at all times of the year, and this includes the winter months when the construction industry slows somewhat. The actual price of these porcelain tiles depends on the shipping method, quantity desired, and the original manufacturer. Most orders are for multiple pallet loads that are easily shipped by freight van. Larger, full-container orders are often shipped directly from the manufacturer to a commercial job site or construction project. Stonexchange specializes in all types of natural stone products for residential and commercial properties. We offer high-quality marble, granite and travertine products in addition to specialty tiles made from porcelain. Because we import our material on a constant basis, we enjoy lower than average freight costs, and we pass this savings on to our commercial clients. Our company has a minimum order requirement on all of our natural stone products. This is of no real consequence for commercial customers because they are usually in need of hundreds or even thousands of pieces. Most of our commercial clients are very pleased with the per-piece cost of materials purchased from our Miami-based distribution center. Most of our products are manufactured overseas and delivered to us via container ship. We oversee the manufacturing operations ourselves, and we can generate immediate price quotes for prospective clients. The actual timeline between order placement and delivery depends solely on whether the collection style required by the customer is currently on hand. If a custom order requires special manufacturing procedures, the delivery time may as much as two month. On the other hand, we stock most of the common styles and colors at our distribution center in Florida, and overland shipment of these tile collections is immediate. Our materials are carefully inspected prior to shipment, loaded and packed into specialized freight containers or wrapped pallets, and sent by a trusted freight line to our customers. On average, a two- to three percent damage count is experienced when natural stone is sent via overland freight line. Stone tiles are packed tightly together in a wood or composite material container, and any breakage is usually the result of an accident involving a lift truck or a dropped pallet. Our customers will be given complete information on how the expected damage is figured into the price quite generated when an order is placed. Stonexchange is a recognized leader in the importation and distribution of beautiful, natural stone products. We offer some of the lowest prices in the industry and make our products available to commercial clients year-round. Contact us online or by phone, and find out just how simple it is to purchase top-quality porcelain at wholesale prices. Cream to Dark Brown slight veins polished porcelain Tile. Solid Light Gray Polished Porcelain Tile. Dark Cream Light Brown to Yellow Veins Polished Porcelain Tile.